The very first really popular publication about Paul Edmund de Strzelecki, a Polish traveler and scientist, the man who nearly 170 years ago named the highest peak of Australian Alps Mount Kosciuszko. Strzelecki created the first geological map of NSW and Tasmania, and was the first scientist preaching sustainable farming and respect for the culture of indigenous population of the Colonies. 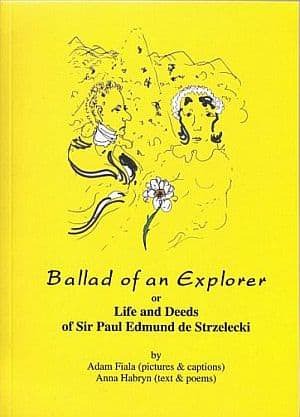 The book is titled a „Ballad of an Explorer or Life and Deeds of Sir Paul Edmund de Strzelecki”. It contains an illustrated humorous biography of the traveler, by Adam Fiala, and completely serious calendar of Strzelecki's life, with some poetical comment by Anna Habryn. Both authors of the book live in Perth, Western Australia. This book, intended for both the young people and adult, is of a great cognitive and educational value. The launch of the book „Ballad of an Explorer …” will take place in Perth (WA), at the Citiplace Community Centre, City Station Complex, Barrack St. (cnr. Wellington St), on 24 October 2009 at 2.30 pm. _Here is a photo_ gallery on the promotion of the book „Ballad of an Explorer…” in Perth. If you would like to receive the book send the order _form_ to Dr Anna Habryn - Secretary Mt Kosciuszko Inc.